Zain Malik is known to be rich. As a son-in-law of Malik Riaz Hussain, the founder and owner of Pakistan’s largest builder and real estate developer, Bahria Town, he must have tens of billions of rupees at his disposal. When he opened an account in 2014 and deposited 8.3 billion rupees in it through 147 transactions, nobody would have suspected any foul play. It was a joint account — to be operated collectively by Zain Malik and a virtually unknown person, Mushtaq Ahmed. The account remained highly active for 16 or so months after it was opened. A total of 4.38 billion rupees were withdrawn in cash from it and another 3.92 billion rupees were transferred to other firms and individuals. Some of this money – 517 million rupees – was used for injecting equity into Summit Bank Limited, a private financial institution which has its headquarters in Karachi, through a resident of the United Arab Emirates (UAE), Nasser Abdullah Lootah. Another 159 million rupees were used for purchasing foreign currency. A Karachi-based company, A-One International, was the largest recipient of money from the joint account. Between April 2014 and June 2015, it received 1.9 billion rupees through 11 bearer cheques. Another 1.25 billion rupees were transferred into a ‘fake account’ that the same company operated at Sindh Bank (which is owned and operated by the provincial government of Sindh). A-One International’s registered owner, Tariq Sultan, is reported to have no knowledge of owning the company, let alone receiving large sums of Bahria Town money. The bearer cheques used for withdrawal of money from the joint account carry his signatures on their back but these are reported to be fake. These allegations have been made in a multivolume report prepared by a six-member Joint Investigation Team set up on the orders of the Supreme Court to investigate a corruption, kickbacks and money laundering scam, initially involving 29 ‘fake accounts’. Zain Malik is said to have told the investigators that the money deposited in the joint account was an advance payment made to Omni Group, a conglomerate of sugar mills, power plants and other business concerns, so that it could purchase some high value land in Clifton, Karachi, for Bahria Town to develop and market. The investigators question this rationale, arguing that Omni Group is neither a real estate provider nor does it own any prime land in Clifton. They allege the actual recipient of the deposited money was former president of Pakistan, Asif Ali Zardari, who purportedly has close personal and business relations with the owners of Omni Group. The money was allegedly given to him for facilitating Bahria Town in acquiring more than 11,000 acres of state land for a housing scheme being built in Karachi’s Malir district. 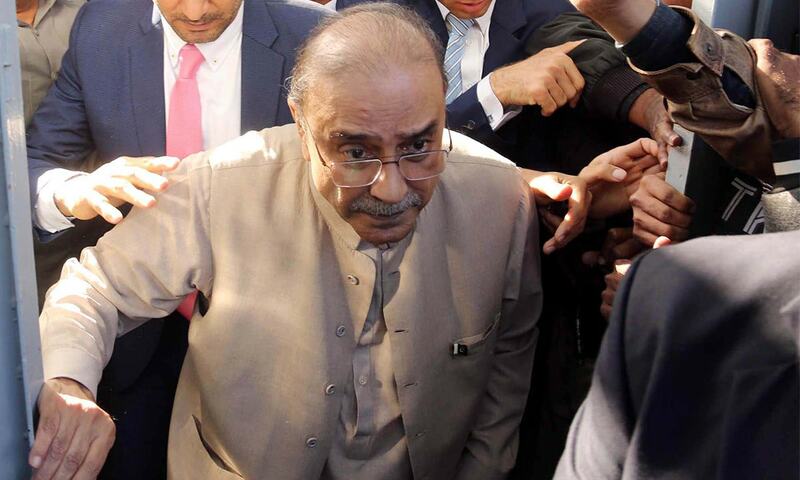 The investigators claim that Ahmed’s identity is a key piece of evidence linking Zardari with the money. His Computerised National Identity Card (CNIC) shows him to be a resident of Islamabad’s Zardari House (which is owned by Zardari) and he is reported to have got a temporary job as a stenographer at the President House, Islamabad, on March 11, 2009 when Zardari was the president of the country. Ahmed was soon promoted to the post of an assistant private secretary to the president. He was also allegedly seen at the Benazir Bhutto International Airport (the old Islamabad airport) on March 14, 2015, allegedly ensuring special facilitation measures for a model, Ayyan Ali. She was arrested later on the same day for allegedly trying to take more than 500,000 US dollars out of Pakistan. Five days after her arrest, political secretary to Zardari, Rukhsana Bangash, is said to have written a letter to Ahmed, informing him that he was being appointed as a private secretary (in grade 18) to Zardari (who, by then, was no longer the president but was still entitled to have some staff at the government’s expense). Two weeks later, Ahmed left Pakistan and has not returned since then. Responding to a questionnaire sent to him by the investigators on October 10, 2018, Zardari said he had “no acquaintance” with Ahmed even though the investigators claim he had accompanied Zardari on almost every official and private foreign trip between 2008 and 2013. The investigation report also quotes Zardari as later changing his statement. In an interview with the investigation team on November 28, 2018, he said Ahmed had been “his physiotherapist”. Yet, at least in theory, this alone would not qualify Ahmed to open and operate a multibillion rupee joint account with one of Pakistan’s richest men. He was a nominee of Omni Group, state Bahria Town’s lawyers in a rejoinder that they submitted at the Supreme Court earlier this year in response to the investigation report. Omni Group does not accept this to be the case. M Jamshid Malik, a lawyer representing the group at various judicial forums including the Supreme Court, denies that Ahmed was his client’s nominee. “Mushtaq [Ahmed] has no relationship with the Omni Group of Companies. He was neither an employee nor known to the group,” he says in an email. For the investigators, this denial seems to matter little. Ahmed’s role in the joint account and his personal history have already sufficiently proved to them that there is a three-way nexus involving Zardari, Omni Group and Bahria Town. This excerpt is part of the Herald's April 2019 issue. To read more, subscribe to the Herald in print.